Scott Bader Ltd. is exhibiting for the first time at the Engineering Design Show 2012, which runs from October 10th – 11th at the Jaguar Exhibition Hall, Ricoh Arena, Coventry. As well as having a stand (D65), Scott Bader is giving a presentation. On day two of the show, Dr. Gavin Creech from Scott Bader’s R & D Applications Engineering Group will make a 45 minute workshop presentation commencing at 10:15am titled ‘Engineering with Structural Adhesives’ during which he will give practical advice on the use of structural adhesives with composites, metals and plastics. The Scott Bader stand will feature their range of primer-less Crestabond® methacrylate structural adhesives which require no or only minimal surface cleaning of bond surfaces. 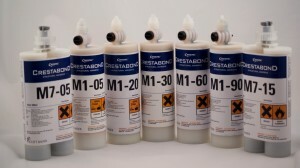 The Crestabond adhesives range has been specially developed for rapidly bonding a wide variety of composites, metals and plastics commonly used in industrial applications. Being able to use one adhesive to bond so many different types of substrates has provided attractive shop floor benefits and savings in production assembly. 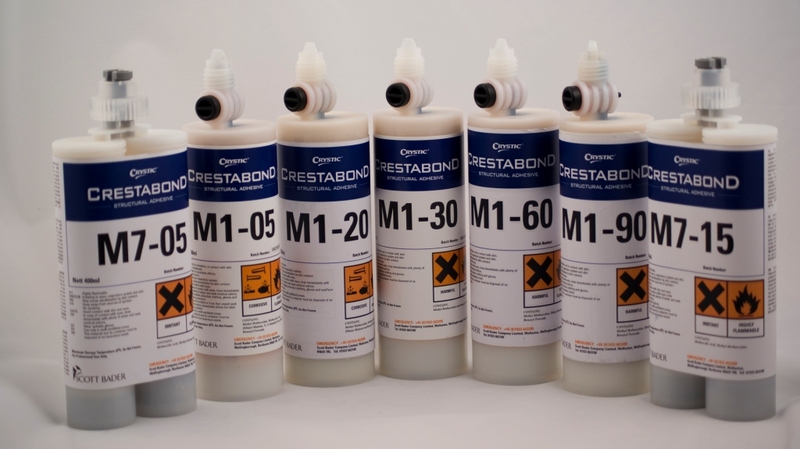 Manually applied with a cartridge hand gun or using a pneumatic hand gun with a bulk dispensing machine for higher volumes, Crestabond adhesives are now being cost effectively used in many demanding marine, building and construction, truck, bus, and other vehicle applications. Many composite fabricators have capitalised on the significant weight saving, performance enhancement, increased productivity and shop floor health benefits of using a structural adhesive in preference to over-laminating, particularly for larger composite structures. Also featured will be their Crestapol® range of high performance resins specially developed by Scott Bader for manufacturing glass fibre and carbon fibre reinforced composite parts with exceptional fire, smoke and toxicity resistant (FST) properties, suitable for buildings, passenger rail and other land transportation applications. According to Scott Bader, their Crestapol high performance urethane acrylate based resins bridge the technology gap between polyesters and epoxy resins. Crestapol resins offer superior mechanical, FST and high temperature performance, even above 240°C, rivalling epoxy systems and engineering thermoplastics such as PI, PEI and PEEK, yet are fabricated at room temperature using conventional polyester production processes; grades are available in a choice of closed moulding and pultrusion options. Traditional polyester and vinyl ester resin composite fabricators can incorporate fillers, carbon fibres and glass fibres into component designs without having to specify an epoxy resin or carry out any radical processing changes. Crestapol resins have the added production benefit of needing only short periods of moderate post curing to achieve good mechanical and high temperature performance.